Taper week has been much less crazy-inducing this time around. 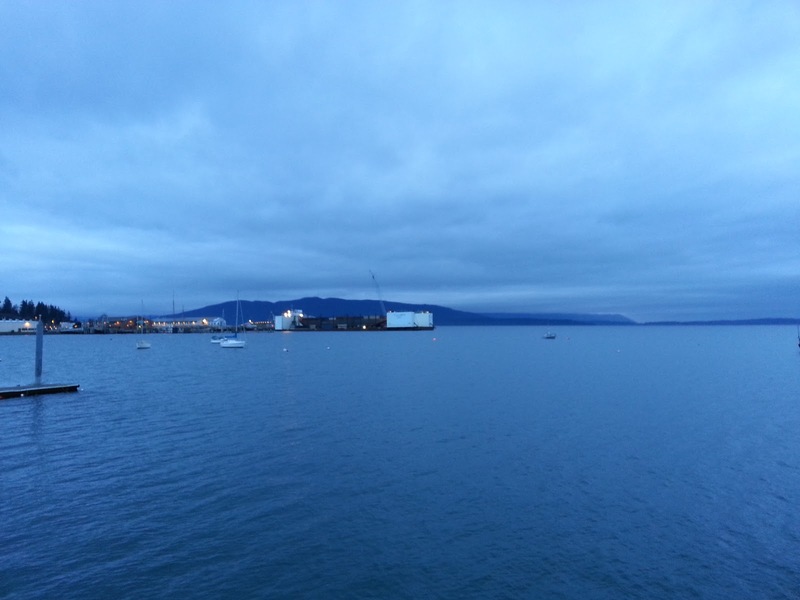 The first time I tapered for a week for my first half-marathon, I was used to my daily workouts in New York. However, since I'm in Washington, I don't have a normal schedule anyway, so it feels less weird not to be doing a workout every day. I ran a short 3 miles this morning, one slow then two at my half-marathon goal pace. I felt strong the whole way so hopefully that's a good sign! After a late lunch, my sister and I drove to Fairhaven, a cute bayside area of Bellingham, the "big" city in my county. And by big I mean 80,000 people. We walked my parents' dogs and Mason along the waterfront and then got them jackets at the local humane society's store (our dogs are spoiled). Once we got home, we finished the day off with some yoga (a Tara Stiles relaxing flow from her This Is Yoga DVD collection) before a big salad and homemade pizza for dinner. Wednesday's challenge was to name three things you loved about yourself. I loved this challenge because I think women in particular are so likely to be hard on themselves, especially their physical appearance. It's important to remind ourselves that there is beauty in each one of us! So... first thing I love is my eyes. They're multicolored -- brown, blue, and green. My eyes are my favorite facial feature. I almost always wear mascara because I think it makes them pop. Seriously, I'll have no other makeup on, but I need some mascara. Second thing I love? My legs. For the longest time I hated my legs because that's where I tend to store fat, but over the past year, as I've realized all they're capable of and felt them grow strong with muscle, they've become one of my favorite parts of my body. Finally, I love my positive attitude. I try to keep a smile on my face as much as possible and "reframe" negative occurrences to figure out what's good in them. It's interesting because I think a year ago I would have had a lot more trouble coming up with a list, especially including anything physical. However, a year of working out and running has made me love my body so much more, and not just because it's tighter and more toned -- it's because I know what it's capable of doing! It's incredible what a positive impact exercise has had on my life, both physically and mentally. 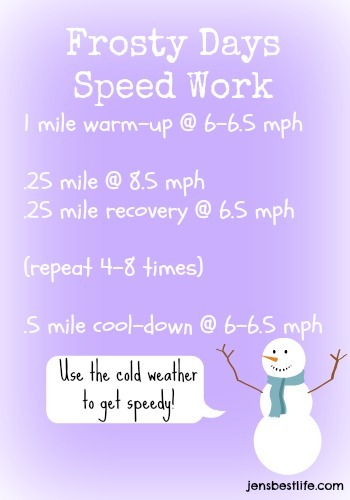 I've been committing to speed work since I started training for the New Year's Eve half-marathon, and I'm going to keep this commitment up in 2013 since one of my biggest goals is to get faster. So far it's been working and I want to keep the progress going! This is the basic speed workout I've been doing to increase my speed, in addition to a spin class once a week. I've been doing it on a treadmill since I have some asthma-like breathing issues when I go my fastest pace in the cold. FYI: I wrote .25 miles rather than 400 meters because it's easiest to track on a treadmill. 400 meters is actually 0.2485 miles, but I assume you won't be angry that I rounded up and added an extra .0015 miles. For an added challenge, you can increase the high speed for each interval. I typically go from 8.5 to 8.6 to 8.7 and finish with an interval at 8.8 before cooling down. Do you do speed work, and if so, what workouts do you do? What are three things you love about yourself? When I trained for my half-marathon this past summer, I would (try to) do speedwork once a week on a local HS track. 400m repeats were my go-to, and I also did a lot of "sprint the curves, jog the straightaways," which my HS track team did frequently. I haven't been doing speedwork as regularly now, but I've noticed an increase in speed because I've been biking a lot--clicking over to your Flywheel post now! I'm dying to try it! 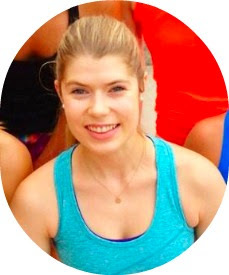 Let me know if you ever want to take a Flywheel class with me! I'm a big fan and think they've definitely had an impact on my speed. I pretty much don't wear much makeup (total laziness!) but a little mascara does make a world of difference! even for those of us with not such spectacular colored eyes! 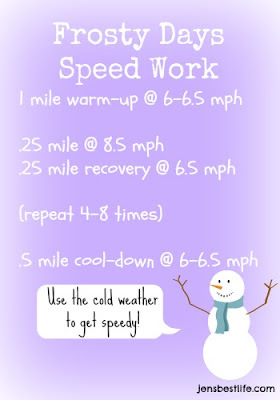 I love your speed workout - it's pretty much identical to mine, and it really works! Good luck with your taper! I will be doing indoor, tread speed work once a week this winter (icy Michigan roads/sidewalks = no bueno) as I prepare for an April half marathon. Thanks for the frosty days idea!